The City of Atlanta has closed West Peachtree Street between North Ave and 5th Street to access and repair a void under the road until further notice. Due to the closure, the Xpress stop located at North Ave Marta Station @ West Peachtree & Ponce De Leon Ave will be inaccessible by transit, and customers are advised to utilize another stop along their route in lieu of North Ave Marta Station. We apologize for the inconvenience. The last afternoon stop will be Linden Ave & West Peachtree. All passengers must board at Linden Ave & West Peachtree St.
Due to sidewalk closures for construction involving the development of Norfolk Southern’s new headquarters, Xpress Commuter Service bus stops for routes 400 and 416 will be impacted beginning Monday, March 25, 2019, until Fall 2021. In addition, these routes will be rerouted on Peachtree Street (northbound) turning left on Linden Avenue, making a right on W. Peachtree and concluding service at North Ave MARTA Station. If you have any questions or concerns regarding this matter, please contact Xpress at 844-XPRSSGA (977-7742). In the map below, the blue “X” represents the stops that will not be serviced, and the “red” marker represents the temporary bus stops that have been put in place. 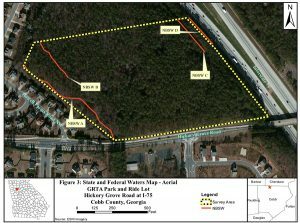 SRTA plans to build an Xpress Park and Ride parking lot in Cobb County on a new location north of the intersection of Hickory Grove Road and Shiloh Road. – Four (4) car spaces reserved for future EV charging stations.